TORONTO — Women’s health company Damiva is working with kathy ireland Health & Wellness to expand nationally into Cardinal Health Inc.’s consumer health division, which serves thousands of independent pharmacies. Damiva said Thursday that its line all-natural feminine hygiene products is now available at all Cardinal distribution centers, as well as at select Target and CVS drugstores. With the expanded distribution, women in need of natural products for vaginal dryness can now buy Damiva products at independent and specialized hospital, gynecology, oncology and other clinic pharmacies across the country, according to the company. 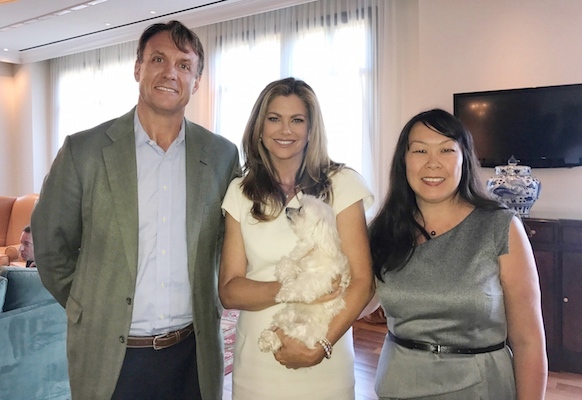 Damiva president Gardiner Smith and chief executive Chia Chia Sun with Kathy Ireland of Kathy Ireland Worldwide. Mae by Damiva, a vaginal suppository, is formulated for long-term vaginal health. Cleo by Damiva is a labial skin moisturizer that complements Mae. Both products are designed for feminine dryness related to birth control, childbirth, hysterectomy, cancer and menopause. “All of us at kathy ireland Worldwide and Level Brands congratulate Chia Chia and Damiva on this incredible launch,” stated Kathy Ireland, chair, CEO and chief designer of kathy ireland Worldwide (kiWW) and chairman emeritus and chief brand Strategist of Level Brands Inc.
Damiva products are sold on the feminine hygiene shelf in drugstores and are recommended by physicians, pelvic health experts, and oncologists across North America. The products are optimized for pH and scientifically formulated to be all natural. They contain a handful of natural, plant ingredients instead of hormones, chemical preservatives and alcohols. Last month, Toronto-based Damiva said it had entered an agreement for brand marketing management and strategic advisory services from Level Brands’ Encore Endeavor One (EE1) and Ireland Men 1 (I’M1) units. And in an associated agreement, Damiva will receive strategic brand management services from kiWW. Including the new distribution through Cardinal Health, Damiva now sells its Mae and Cleo feminine moisturizers at more than 4,000 drug stores and health food stores in Canada and the United States. Damiva said additional pharmacies and health food stores are continually being added to its retail distribution. Charlotte, N.C.-based Level Brands focuses on corporate brand management and consumer products marketing art, beauty, fashion, health and wellness, travel, and entertainment. Its licensed brand marketing businesses include I’M1, for Millennial men and the women who love them; EE1, a corporate brand manager and producer of experiential entertainment events and products across platforms; and Beauty & Pin-Ups, a hair care and disruptive women’s products brand.